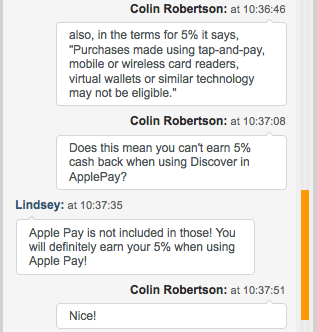 Discover Will Soon Work with Apple Pay: Time to Apply and Earn 23% Cash Back? It was announced last week that come September 16th, you’ll finally be able to use your Discover credit card(s) with Apple Pay. While this is surely welcome news to Discover cardholders who want to use their phone instead of their credit card while checking out, there’s even better news related to the delayed launch. When Discover goes live on the Apple Pay platform, Discover cardmembers will earn a 10% Cashback Bonus on all purchases made in-store via the payment service, up to $10,000 in purchases, from now until December 31st, 2015. This is on top of whatever you’d normally earn in the way of cash back from rotating categories and the standard cash back all Discover purchases earn. And for those with Discover it Miles, Miles, or Escape, you’ll earn an extra 10 miles per dollar on up to $10,000 of in-store purchases when using Apple Pay. It’s their way of saying thank you for your patience, and also a way to encourage Discover cardmembers to add their Discover credit cards to the payment service. In order to use Apple Pay in stores, you need an iPhone 6 or better. I currently have the iPhone 5s, but I’m due for a free upgrade (or subsidized upgrade) in late October. I’m definitely going to take advantage of this deal to get 23% off all my purchases made with Apple Pay. Here’s how you can earn a stellar and unbeatable 23% cash back until the end of 2015. Step 1: Open a Discover it Miles credit card. Step 2: Add the card to Apple Pay. 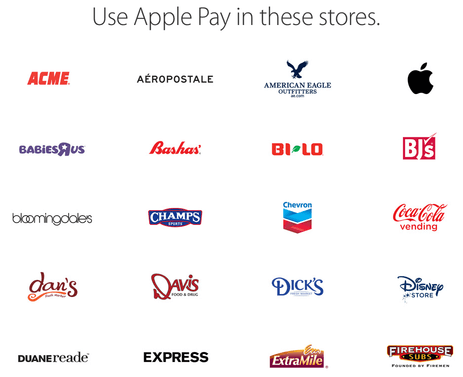 Step 3: Use the card when you pay with Apple Pay at stores (not online). That’s it! You’ll earn 23 points per dollar spent from September 16th until December 31st, 2015. That works out to 11.5 points per dollar when new cardmembers select Apple Pay to pay for purchases, which are doubled to 23 points per dollar on your cardmember anniversary. 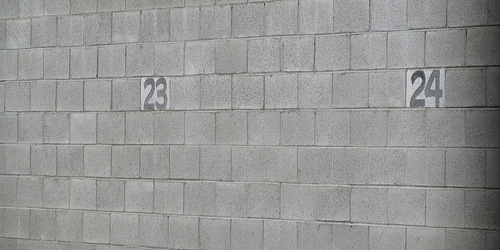 Put another way, that’s 23% cash back because each mile (they’re not really miles but who cares!) are worth a penny each. If you spend the entire $10,000 by the end of the year via Apple Pay, you’re looking at a $2,300 payday, which is pretty darn incredible. This can’t really be missed. I applied for the Discover it Miles card this morning because I want to take advantage and see if I can earn the full $2,300. I spoke with a Discover chat rep who confirmed that the 10 bonus miles are also doubled for new cardmembers. For the record, I already have the regular Discover it card, but I still get double miles because I’m a new Discover it Miles cardholder. Basically once I get my new iPhone, I’m going to do my best to maximize this deal in November and December. It’s definitely a good time of year to do some spending, so I think I’ll be able to get the full value. The only problem is that Apple Pay isn’t accepted everywhere, so I’ll need to research which stores I can get the most mileage out of. The screenshot above shows just some of the possibilities. I may buy a new MacBook for 23% off to get things going, and maybe take 23% off my gas at Chevron on my way to the Apple Store. If you have the Discover it CashBack card, it may be possible to earn even more cash back if you purchase items from select stores in the 5% cash back rotating categories and use Apple Pay. For example, if you shopped at Bloomingdale’s you’d get 5% cash back when using the Discover it card. You’d also earn 10% cash back for using Apple Pay, and if you’re a new cardholder, that 15% combined would be doubled to 30% cash back. The only caveat is that the 5% rotating categories only allow for $1,500 in total spending per quarter. And yes, this can be combined, I even asked a Discover rep via chat. I’ve seen people mention 32% cash back, but I think they’re adding the 1% cash back you get on every purchase with the 5% rotating categories. That’s not how it works. You just get 5% instead of 1%. Anyway, I will update this post with my shopping results when they come in. Tip: Discover is a pretty conservative card issuer so if you aren’t instantly approved, give them a call. If you already have a Discover card, they may ask that you move some of the existing credit line to the new card, which is totally fine.